Whose Power Is It Anyway? Are you watching the paranoia-inducing television show “Mr. Robot” on USA Network? Universal Cable Productions green-lighted season 2 before the first episode aired. For good reason, too; the show is not brainless fodder; it’s actually thought-provoking. Now season 2 is underway and it’s as gripping as a train-wreck in real time. The activity that fuels the Mr. Robot story-line is human exploitation and the struggle to remain in control of self. There’s a scene in Mr. Robot’s episode 3, where Ray (Craig Anderson) is attempting to bring Elliot Alderson (Rami Malek) into his confidence. Allegedly unbeknownst to Ray, Elliot is a hacktivist who wants to crash the system, otherwise known as western civilization. Couple that scene with an earlier scene, in which we see Ray consoling a badly beaten man (a computer programmer and former worker) while his family cowers in the background. Those two scenes communicate the message that people exploit vulnerable people for their own gain. It appears, however, the programmer is no longer useful to Ray since he doesn’t have the necessary skill-set for Ray to get his bitcoin business functioning again. At the scene’s end we see Ray talking to a man who appears to be the muscle of the business. He tells the man, paraphrasing here, there’s no way to beat the skills into the man. From this moment, we’re led to believe Ray needs new talent and that talent may lie in Elliot. Ray has stalked Elliot, since the first episode of this season. After finding one of Elliott’s journals, it appears Ray may have learned how to exploit Elliot’s talent. Aside: Elliot is a computer hacker extraordinaire and knows how erase his own digital footprints but he leaves a physical paper trail? Oh the irony. There’s no indication in the series, thus far, Ray knows Elliot is skilled at computer hacking. Nor does he know Elliott is a victim of his own mind. None of this activity appears to happen on screen, anyway. The only indication we get that Ray may know a little bit about Elliot is when Ray asks Elliot at the end of episode 2 – why Elliot would ignore him after speaking with him at length the night before. Whatever information Ray has gleaned; it seems he intends to use it for his benefit. Ray, it seems here, represents an encapsulated view of society as a whole. Unlike 4-legged animals who exploit vulnerabilities in their prey in an effort to eat; 2-legged animals exploit each other for far more nefarious reasons. One of the flaws (faulty law) in human behavior is our desire to exploit human vulnerabilities in an effort to control another’s will. It is more than just a brain defect in some that causes humans to turn another into their lab assistant, Igor, in an effort to create a Frankenstein to do bidding. This cultivating of vulnerabilities for later exploitation begins at birth. What’s more it’s has been a way of life for 5 millennia. Our F-Society, built on nothing but consumption, creates individuals with the express desire to break them soon after they leave the womb. By the time they are of adult age they’re dependent on everything outside of them. They never mature beyond the mentality of rebellious teenager. They know there’s something wrong but they’re powerless to fix it. It is not hard to figure out why these individuals are powerless. As a society, we’ve carefully taught them, through our traditions, to give their power away to something outside of them. Then they become like a drained battery unable to re-energize themselves. Depleted, they begin searching for anyone or anything outside of them to give them a jumpstart – a boost. They look for energy in food, narcotics, alcohol, games, entertainers, athletes, televangelists, television, theater, music, so-called leaders, anything that’ll give them a quick “hit”. Instead of getting recharged, however, they end up energizing the very thing they looked towards to get a high. What we pay attention to expands, what we neglect, shrinks also known as Thermal expansion. This natural law has real life implications. For example when someone pays you a compliment – you get heated, maybe blush a bit – that’s heat transfer that causes expansion. The slang term is “gas up”, “puff up” and it means they’re animating what is outside of them. They’ve been carefully taught to give their power to institutions, traditions and people until there’s nothing left inside to reboot their own internal operating system. No one taught them how to turn their attention inward. This human design flaw is not innate – it comes as a result of a “virus” transmitted via an external operant conditioning (reward and punishment) system. The system is flawed – but all it requires to operate is the subject’s belief in it. Despite the number of disciples, and the amount of time spent operating under this system. We do have the power to override it and return to our original programming. 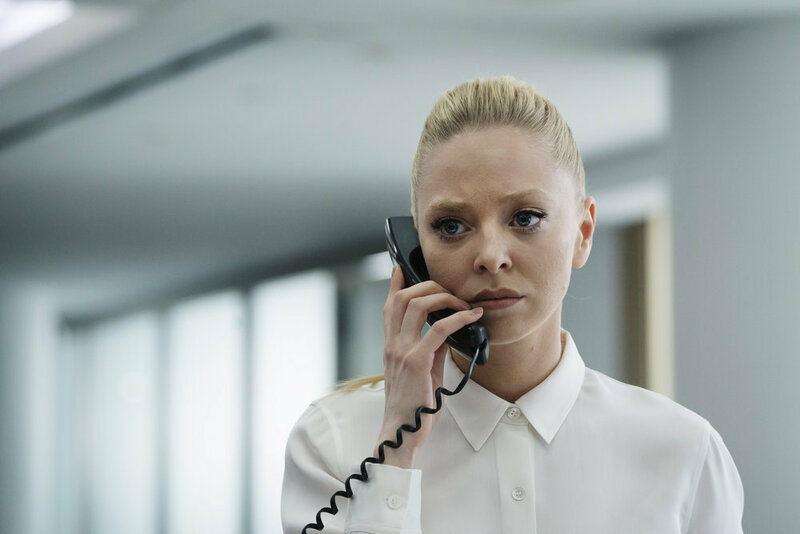 Enter Angela Moss (Portia Doubleday), the outlier. Angela’s mother died from cancer allegedly caused by chemical exposure due to negligence of E Corp. Her boyfriend cheated on her; downloaded malware on his computer which exposed them both to blackmail. Angela suffered a devastating blow to her professional credibility at her former workplace. What’s left of her family, her father, is drowning in debt. Angela now works as a “mouthpiece” (PR Manager) for the company that may be responsible for her mother’s death putting her on the path of “If you can’t beat ‘em, join ‘em; then when you’re strong enough, destroy ‘em. The latter remains to be seen. Right now, it seems the only way Angela can function at her optimum performance level is by reprogramming herself in an effort to take her power back and control of herself. Sure she’s using a motivational recording to remind her of what she already knows. The recording is forcing her to keep the attention and focus on where it belongs – on Angela. Overriding a virus (worm) that is backed up through media messages of “look at me, look at me” and saved daily will take a lot of repetitive steps to remove it. Angela Moss isn’t the main character of Mr. Robot, she exist in our periphery. When you shift your focus from the center, you’ll see Angela may have a lot to teach us about reclaiming our individual power.